Top Five Books, LLC, 9781938938153, 264pp. On April 2, 2014, the U.S. Supreme Court struck down aggregate limits on how much money individuals could contribute to political candidates, parties, and committees. The McCutcheon v. FEC decision fundamentally changes how people (and corporations, thanks to Citizens United) can fund campaigns, opening the floodgates for millions of dollars in new spending, which had been curtailed by campaign finance laws going back to the early 1970s. 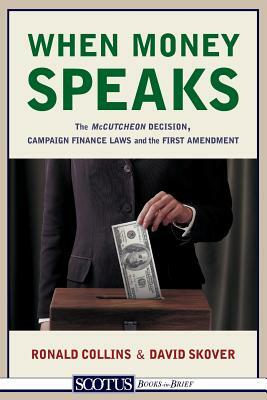 WHEN MONEY SPEAKS is the definitive-and the first-book to explain and dissect the Supreme Court's controversial ruling in McCutcheon, including analysis of the tumultuous history of campaign finance law in the U.S. and the new legal and political repercussions likely to be felt from the Court's decision. McCutcheon has been billed as "the sequel to Citizens United," the decision giving corporations the same rights as individuals to contribute to political campaigns. Lauded by the Right as a victory for free speech, and condemned by the Left as handing the keys of our government over to the rich and powerful, the Court's ruling has inflamed a debate that is not going away anytime soon, with calls for new laws and even a constitutional amendment on the Left-while many on the Right (including Justice Clarence Thomas in his concurring opinion) call for an end to all contribution limits. Two of the nation's top First Amendment scholars-Ronald Collins and David Skover-have produced a highly engaging, incisive account of the case, including exclusive interviews with petitioner Shaun McCutcheon and other key players, as well as an eye-opening history of campaign finance law in the U.S.